Love this time of year and the weather - and my favorite holiday is coming up soon! Is Autumn your favorite season? I hope you're having a fabulous weekend. Fall is definitely my favorite too! Love the pics, the set is so different from what I'm used to. :) You look great, the pattern looks fab on you. I love fall as well and that dress is beautiful! Target?? Really??? I adore fall as well! The weather starts to become bearable in AZ! That jacket is gorgeous & looks great with the dress! This outfit makes me want to have warm apple cider :) I love that jacket paired with the earthy dress - you look stunning! Great outfit. The dress really matches the season. I recently have been finding cute stuff at Target. I would've never known they had stylish pieces for reasonable prices. Your white Danielle Earrings look great with this look too! 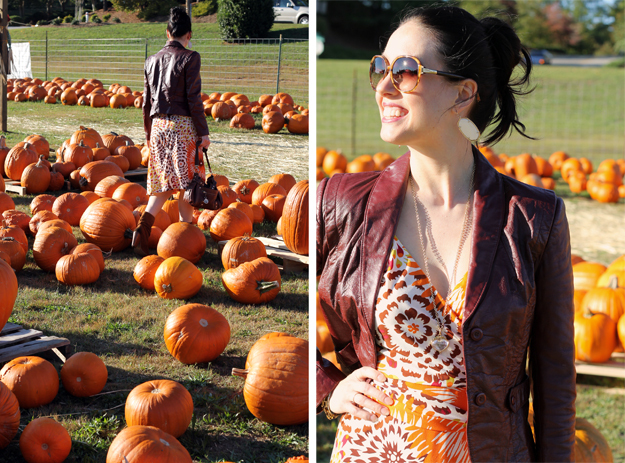 I love the leather jacket paired with your maxi...what a great way to turn a summer dress into a fall ensemble. Thanks again for the love! I love that you match the pumpkins! Great outfit! Seems like you had a blast. Lovely pics! !